This month, the Las Vegas business community lost two men — E. Parry Thomas and Joel Bergman — who helped shaped the city and its iconic Las Vegas Boulevard. Joel Bergman died Aug. 24, aged 80. 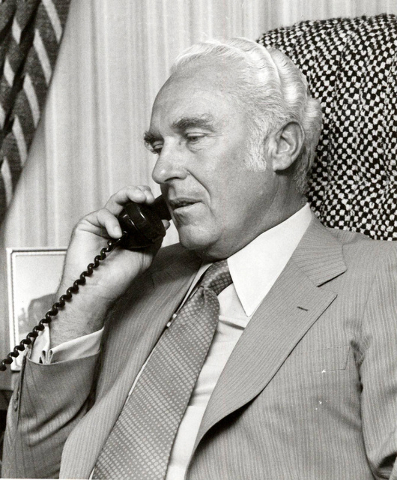 E. Parry Thomas speaks on the telephone in this Review-Journal file photograph dated July 1977. Thomas, a banker, made financial and political contributions to Las Vegas that changed the landscape of the city and how it does business. Thomas, an Ogden, Utah-native, born June 29, 1921, came to Las Vegas in the mid-1950s. 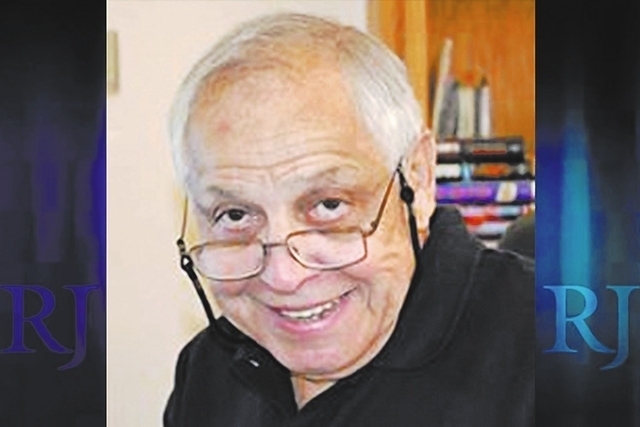 Longtime journalist A.D. Hopkins gave details of his life in a Las Vegas Review-Journal Aug. 27 tribute article. His employer at the time, Walter Cosgriff of Continental Bank and Trust Co. in Salt Lake City, asked for Thomas’ opinion on whether or not a struggling venture, Bank of Las Vegas — later became Valley Bank — he owned partially, was viable. Thomas ended up staying on in Las Vegas, eventually becoming chairman of Valley Bank. He was the first banker to make a loan to a casino operator, lending approximately $750,000 to Milton Prell of the Sahara for an expansion. That wasn’t something that was done at the time, but Thomas believed Las Vegas was on the cusp of a vibrant future and investment was key. Thomas was also an integral part of early ventures such as The Dunes and financing casino legends, such as Steve Wynn. In a 1999 interview in the Las Vegas Review-Journal, Jack Binion said casinos were forced to rely on their own cash before Thomas’ arrival. “If Vegas had to be built for cash all these years, figure how it would be stunted for growth,” Binion said. Thomas spent most of his life in banking, except the time he served in an intelligence unit during World War II. His father, a successful plumbing contractor, took over a failed bank during the Depression and Parry helped collect loan payments. When the war ended, Thomas went to work for Continental Bank. In the early 1960s, Thomas made another move that created space for large players to invest in Las Vegas and bring the city to the level it sits at today. During that era, casinos could only be operated by individuals licensed in Nevada — a law intended to keep organized crime out of the picture, which was usually side-stepped through strawmen. This meant that shareholders investing in public companies would have to be individually licensed in order to buy shares, which was not practical. Thomas set out to change that. Thomas and his business partner of four decades, Jerry Mack, made it their mission to change this law, which they saw as limiting growth in the casino industry. They worked to help make Nevada corporate ownership evolve into what it is today. Thomas was also known for the properties and hotels he purchased on behalf of reclusive billionaire Howard Hughes. And, together with Mack, he was an integral part of the University of Nevada, Las Vegas’ expansion. Their names are now painted across the university’s Thomas &Mack Center. Valley Bank was sold to Bank of America in the early 1990s and Thomas, along with his wife, Peggy, moved on to spending time in Southern California and in Hailey, Idaho. Thomas died on Aug. 26, surrounded by his wife and children, at his horse ranch in Hailey, Idaho. He was 95. He still maintained a Las Vegas residence at the time of his death. Thomas is survived by his wife Peggy, of Las Vegas and Hailey and his four sons: Peter M. Thomas, Roger P. Thomas, Steven C. Thomas and Thomas A. Thomas, all of whom live in Las Vegas. He is also survived by a sister, Jane Sturdivant of Hailey, and 13 grandchildren and nine great-grandchildren. A Las Vegas memorial service is being planned for Sept. 6 at Encore. While Thomas provided the cash flow for a growing city, Bergman, an architect, is known for giving it his style and design. Bergman, born in Los Angeles on Aug. 20, 1936, spent more than 45 years bringing grand luxury to the Strip. One of Bergman’s early designs on the Las Vegas Strip — considered by many the forerunner of the mega-resort era in the city — was The Mirage, which opened in 1989. He began work on that project as an in-house architect for Steve Wynn in 1978, a position he held for the next 16 years. He later designed Treasure Island, or TI. Other projects Bergman created, included Paris Las Vegas, the Signature at MGM Grand and the Trump International Hotel Las Vegas. He also worked on several projects for Caesars Palace, including the Octavius, Palace and Augustus towers. Bergman’s work substantially contributed to the look and feel of the Strip. Bergman died Aug. 24 of natural causes at the age of 80. He is survived by his wife, Valentina, and several children and grandchildren. His four sons are Leonard, George, Valentin and Ivan; his daughters Alessandra and Lori; and his grandchildren, Daryl, Marissa, Nicolle, Lucas, Daniel and Remington. Bergman, Walls and Associates, the company Bergman co-founded in 1994, will live on through his sons: Leonard, president and chief executive of the firm; and George, executive vice president at Bergman, Walls and Associates.